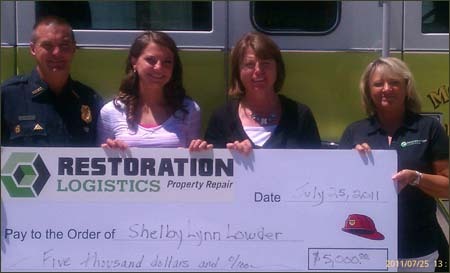 Shelby Lynne Lowder, the winner of the 2011 Restoration Logistics Colorado Fire Service Scholarship award is no stranger to emergency services. Her father,Sheldon Lowder is a 14 year veteran of the Monte Vista Fire Department. Both Shelby’s mother and father have worked as Emergency Medical Technicians for both Monte Vista and Alamosa Ambulance Services. Shelby plans to continue the tradition of serving in emergency services and the health care industry. She is currently enrolled at Utah State University where she will complete her pre-requisites for acceptance into Nursing School. Shelby moved to Utah earlier this summer to complete her Basic Life Support class and enroll in the Certified Nursing Assistant Program. Congratulations to Shelby and her family.